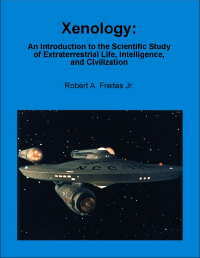 Xenology may be defined as the scientific study of all aspects of extraterrestrial life, intelligence, and civilization. Similarly, xenobiology refers to the study of the biology of extraterrestrial lifeforms not native to Earth, xenopsychology refers to the higher mental processes of such lifeforms if they are intelligent, and so forth. The xeno-based terminology was first coined for this usage by the renowned science fiction author Robert A. Heinlein (starting in The Star Beast, Scribner, New York, 1954 HTML commentary), though the first use of the related word "xenologist" is apparently attributable to L. Sprague de Camp ("The Animal-Cracker Plot," Astounding Science Fiction 69(July 1949); "The Hand of Zei," 1950). This usage was subsequently defended by Heinlein and Harold A. Wooster in a 1961 article published in the journal Science (R.A. Heinlein, H. Wooster, "Xenobiology," Science 134(21 July 1961):223-225 PDF) and by Robert Freitas (CV) in a 1983 article published in the journal Nature (R.A. Freitas Jr., "Naming extraterrestrial life," Nature 301(13 January 1983):106 HTML HTML). The latter article drew a complaint ("Xenology disputed," Nature 302(10 March 1983):102) from four specialist researchers claiming to represent "20 research groups in at least eight countries" who preferred to retain use of "xenology" for the study of xenon concentrations in meteorites (an argument that would not apply to other uses of the xeno- prefix) but their plea has largely failed. By December 2008, Google listed 20,600 entries for "xenology" of which only 1140 referred to xenon and most of the rest referred to the extraterrestrial usage. Online dictionaries (e.g., Webster's New Millennium Dictionary of English, 2003-2008) now typically define "xenology" as "the scientific study of extraterrestrials, esp. their biology." Xenology: An Introduction to the Scientific Study of Extraterrestrial Life, Intelligence, and Civilization is now available on the web. The book was privately published and circulated in hardcopy form during its writing in 1975-1979 and after its completion in 1979. Additional information on the original First Edition of this book is available here, and the full Table of Contents (and free access to the entire text online) is available here. All local URLs and anchored book links from this website will remain stable. Information about the author, Robert A. Freitas Jr. (CV), is available at the author’s homepage. Scientific papers and other articles by Robert Freitas on extraterrestrial life, SETI, and related topics are collected here. Nanomedicine-related websites associated with Robert Freitas include the Nanomedicine Book Site, the Nanomedicine Art Gallery, and the Nanomedicine Page. The Nanomedicine Page includes a nontechnical nanomedicine FAQ and hundreds of links to articles, papers, websites, people and organizations who are active in the field of nanomedicine. Other websites associated with Robert Freitas include the Molecular Assembler website which hosts an online copy of the technical book Kinematic Self-Replicating Machines, and the Nanofactory Collaboration website. The xenology.info domain is owned and webmastered by Robert A. Freitas Jr. Please report errors at this website, whether typographical or substantive, to him.